Fátima is a civil parish in the municipality of Ourém, in the Portuguese Santarém District. Let the collections at Museu Monografico de Conimbriga and Museu Nacional Ferroviario capture your imagination. Discover out-of-the-way places like Convent of Christ and Shrine of our Lady of the Rosary of Fatima. Change things up with these side-trips from Fatima: Capelas Imperfeitas (in Batalha), Monastery of Alcobaca (in Alcobaca) and Coimbra (Old Cathedral of Coimbra (Se Velha de Coimbra) & Biblioteca Joanina - Universidade de Coimbra). There's much more to do: take in the spiritual surroundings of Batalha Monastery, see the interesting displays at O Milagre de Fatima - Museu Interativo, take in the architecture and atmosphere at Basilica da Santissima Trindade, and don't miss a visit to Valinhos Sanctuary. To find more things to do and other tourist information, use the Fatima online itinerary planner . Toronto, Canada to Fatima is an approximately 12.5-hour combination of flight and bus. You can also do a combination of flight and shuttle; or do a combination of train, flight, and bus. Due to the time zone difference, you'll lose 5 hours traveling from Toronto to Fatima. In May, daily temperatures in Fatima can reach 24°C, while at night they dip to 13°C. 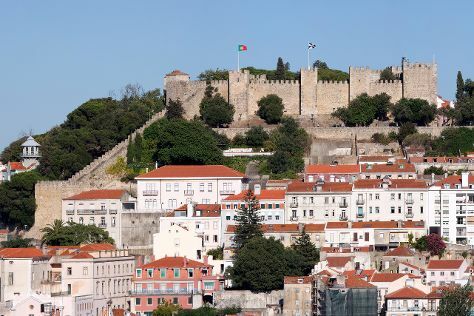 Wrap up your sightseeing on the 17th (Fri) early enough to drive to Lisbon. Your cultural itinerary includes sights like National Tile Museum and Cabo da Roca. Appreciate the collections at Museu Calouste Gulbenkian and Igreja de Sao Roque. Explore the numerous day-trip ideas around Lisbon: Sintra (Castelo dos Mouros, Museu de Historia Natural, & more). There's much more to do: step into the grandiose world of Castelo de S. Jorge, meet the residents at Lisbon Oceanarium, explore the world behind art at Museu Colecao Berardo, and contemplate in the serene atmosphere at Jeronimos Monastery. To find maps, reviews, other places to visit, and other tourist information, read Lisbon trip itinerary planning site . Drive from Fatima to Lisbon in 1.5 hours. Alternatively, you can take a bus. Expect a daytime high around 28°C in May, and nighttime lows around 15°C. Finish up your sightseeing early on the 22nd (Wed) so you can travel back home.